The holorecorder flickers on. The scene is a strangely modified Luxury Space Station, with what appears to be cloning tanks throughout the station. 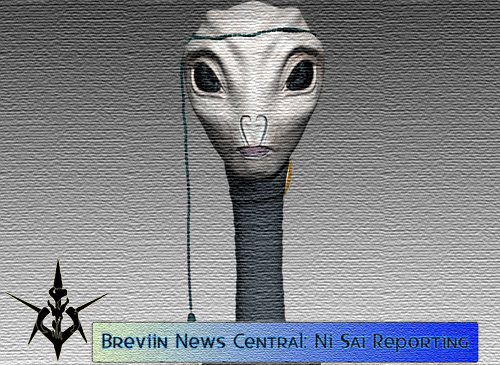 A Kaminoan reporter stands in front of the holorecorder. "Su cuy'gar! My name is Ni Sai, reporting for Clan Breviin's new company, Breviin Clone Camps. A new service has been brought to the galaxy, under the leadership of Peter Max and Xer`da Arman`de. This announcement has come after the first batch of clones was successfully created and finished their academy training. With the help of Kaminoan technology and Mandalorian DNA, the clones have proven on many occasions that they are better than droids. Most of these clones are made from Aliit'buir Peter Max's DNA, but several other sentients have offered to become donors. Peter Max, the leader of Breviin and Breviin Clone Camps has shared a brief history about his clan for customers to get an idea of what this clones are made of." The holorecorder moves to a human male sitting garbed in Mandalorian Armour, other than a helmet. "A smaller clan from the tropical regions of Mandalore. We prefer to have zero direct contact with the outside world. Living in the tropical regions of Mandalore have caused we Breviin to prefer large forests and bodies of water. Breviin are hunters by nature. We pride ourselves on taking down the largest target. We Breviin are a hardy people, and while not being physically strong, our intelligence measures at scales rivaling Cereans. We are hunters, but know how to keep ourselves healthy. After a millenia of slowly dying out due to civil wars, our clan was thought to no longer exist." Breviin warriors, known as A'den be Breviin, are experienced hunters. Sporting armour so different from one another, each warrior can be identified. Each set of armour is specially crafted to fit the warrior's personality, and is presented to them by the Aliit'buir. As of recently allowing other species to join the clan, Breviin have no common physical traits." "So for all vode and anyone else, welcome to Breviin Cloning Camps!"